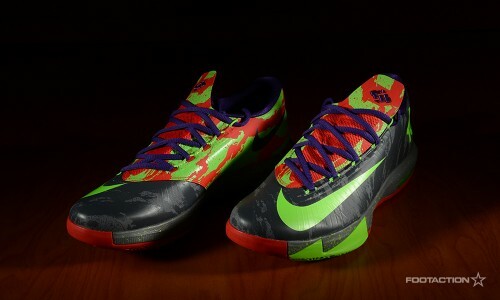 The Nike KD VI “Energy” is named after the highlighted and bright colorway it wears in electric green, bright crimson and purple upon a cool grey camo base. The sneaker additionally sports a green and red camo pattern on its sides and tongue. To round out the details, the “Energy” has green speckles on the grey midsole and green and red accents on the outsole. Released in stores and online today. Print article This entry was posted by hhcblog on January 1, 2014 at 9:05 am, and is filed under Footwear. Follow any responses to this post through RSS 2.0. You can leave a response or trackback from your own site.